Combi-Action™ button is a patent pending technology of B-sm@rk Ltd. The Combi-Action™ button v1 provides an easy integration of a submit button target. Our Combi-Action™ button is specifically designed to let users perform two actions in one. For example: the button in the search feature of a travel agency website can be replaced with the Combi-Action™ button. The user, after having written the destination to search for, can either click on the center button to perform a regular search, or give some more information selecting one of the four side buttons. These side buttons can be customized by the host site and can contain emotions, short sentences, etc… The host site can do different actions, reacting accordingly if a user selects “I hope to find a good deal” or “I value comfort” while looking for a trip to New York. The appearance of the Combi-Action™ button is completely customizable. There is a basic CSS file that will shape the element as in Figure 1, this is to ensure the presence of a style for a basic usage. It is possible to define custom styles, some examples will be shown in this guide. To embed the Combi-Action™ button in your page, you first need to identify the regular button you would like to replace. In the HTML, the button must have a unique ID set to it. The Combi-Action™ button is configurable by a variable called “MultiActionButton_Config” set before its loading. The module will read it and, if everything was set up correctly, eventually replace the regular button with the multi-action one. The “buttons” array is a list of objects which describes each button. The list is ordered and the first object will be Button 0, the second object will be Button 1, and so on. You can specify more than five buttons, but the extra ones won’t be displayed by default. A button object must have at least a “label” OR “image” property set. If an image is set, it will display as in the center button in Figure 1, while a text label will display as the rest of the buttons. 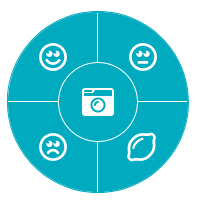 You can specify images for any button, not only for the one in the center. A button also requires an action to fire on a click event. If a suitable action is not found, the CAB won’t initialize. It important to note that the CAB must replace an <input> (or <button>) element inside a form, to allow submitting it on click. Button 4 will submit the form. If the CAB is not inside a form, it won’t be initialized in this case, as there are buttons without a valid action set (Button 0 and 4). If no action is set, “form submission” is the default one. If you have enabled the debug mode, you should receive a clear error message in this last case. However, it is recommended you add this <link> element manually to your page to optimize its loading to your users. If you have your own CSS file which overrides most if not every style rule of the basic one, you can simply add your file in the head section and then set injectBaseCSS to false. In this way the only CSS managing the style of the CAB is the one you specified. If you wish to use the basic CSS, you can either leave containerClass null or set it to “v10”, which is a version of the CAB that comes in the basic CSS. If you want to use your own CSS, we suggest you use a unique class name to set your rules and then add it in containerClass. The easiest way to modify the appearance of the CAB is to start from the base CSS we offer and then override a few rules. Remember to set containerClass in the configuration object to “myOwnClass”! The rule you’ve just seen is targeting the center button having “combibtn” and “myOwnClass” as classes of the general container element. The “combibtn” class is always added by default, while your class name must be specified in the configuration. This will keep your code tidy and modular, separated by the original CAB one. We recommend to take a look into the base CSS file to understand what classes are available and what properties are set. In the following list you will find the most useful classes’ names and elements you can override with your own style. Now that you have set up the frontend, the backend is straightforward. If the action you’ve set for the buttons is to submit a form, you will receive the user’s choice in your form data. Look in your POST or GET data array for the variable called “MABClicked”, its value is the button clicked. key No Null String A key to remove the "power by mysmark" tag and get extra features. Ask for a quote! Warning!!! : If the configuration object has been not created correctly, the Combi-Action™ button won’t load. The “buttons” array is a list of objects which describes each button. The list is ordered and the first object will be Button 0, the second object will be Button 1, and so on. a “label”, it can be just a sting or HTML code; OR “image” link, the image is displayed at the center of button element by default. an action to fire on a click event, “href” link or “callback” function. If a suitable action is not found, the Combi-Action™ button won’t initialize; with debug mode activated, you will receive error message about the issue found. image Yes* String image url link to load inside the button. *it is mandatory if "label" is not defined!!! label Yes* String label sting or HTML code. *It is mandatory if "image" is not defined!!! href No String exit url link for the onclick action. Warning!!! : If the callback is defined with a string this must be the name of a global function. Otherwise no callback is performed and an error in console log is generated. Combi-Action™ button fires a Google Analytic event on click. You can override the base configurations injecting your custom CSS using the injectCSS parameter or adding your style sheet in the <head> after the Combi-Action™ button script, see Embedding session. You can also use a circular version of the Combi-Action™ button loading the following style sheets and adding to containerClass this extra class: circular. Now that you have set up the frontend, the backend is straightforward. If the action you’ve set for the buttons is to submit a form, you will receive the user’s choice in your form data. Look in your POST or GET data array for the variable called “CABClicked”, its value is the button clicked.